Tag Archive | "baby animals"
A white-tailed deer fawn waits for its mother to return. Spring is here, bringing warmer temperatures and the next generation of wildlife. The Michigan Department of Natural Resources reminds those who are outside, enjoying the experience of seeing wildlife raise its young, to view animals from a distance so they are not disturbed. It’s important to remember that many species of wildlife hide their young for safety and that these babies are not abandoned. They simply have been hidden by their mother until she returns for them. Schauer added that some animals that have been picked up by people and do survive may become habituated and may be unable to revert back to life in the wild. White-tailed deer fawns are one of the animals most commonly picked up by well-intentioned citizens. Schauer explained that it is not uncommon for deer to leave their fawns unattended for up to eight hours at a time. This behavior minimizes the scent of the mother left around the fawn and allows the fawn to go undetected by nearby predators. While fawns may seem abandoned, they rarely are. All wild white-tailed deer begin life this way. The best chance for their survival is to leave them in the wild. If you find a fawn alone, do not touch it, as this might leave your scent and could attract predators. Give it plenty of space and quickly leave the area. The mother deer will return for her fawns when she feels it is safe; she may not return if people or dogs are present. Only licensed wildlife rehabilitators may possess abandoned or injured wildlife. Unless you are licensed, it is illegal to possess a live wild animal, including deer, in Michigan. The only time a baby animal may be removed from the wild is when you know the parent is dead or the animal is injured. Please remember, a licensed rehabilitator must be contacted before removing an animal from the wild. Licensed wildlife rehabilitators must adhere to the laws and have gone through training on proper handling of injured or abandoned wild animals. Licensed rehabilitators will work to return the animal to the wild where it will have the best chance for survival. A list of licensed rehabilitators can be found by visiting mi.gov/wildlife or by calling a local DNR office. A white-tailed deer fawn waiting for its mother to return. Although fawns may appear to have been abandoned, that’s rarely the case, and leaving them alone will help them survive. Spring is nearly here, bringing warmer temperatures and the next generation of wildlife. The Michigan Department of Natural Resources reminds those who are outside enjoying the experience of seeing wildlife raise its young to view animals from a distance, so they are not disturbed. It is important to remember that many species of wildlife “cache” (hide) their young for safety. These babies are not abandoned; they simply have been hidden by their mother until she returns for them. Schauer added that some rescued animals that do survive may become habituated to people and are unable to revert back to life in the wild. White-tailed deer fawns are one of the animals most commonly rescued by well-intentioned citizens. It is not uncommon for deer to leave their fawns unattended for up to eight hours at a time. This behavior minimizes the scent of the mother left around the fawn, which allows the fawn to go undetected by nearby predators. While fawns seem abandoned, they rarely are. All wild white-tailed deer begin life this way. The best chance for their survival is to leave them in the wild. If you find a fawn alone, do not touch it, as this might leave your scent and could attract predators. Give it plenty of space and leave the area quickly. The mother deer will return for her fawns when she feels it is safe, but may not return if people or dogs are present. The only time a baby animal may be removed from the wild is when you know the parent is dead or the animal is injured. Please remember, a licensed rehabilitator must be contacted before removing an animal from the wild. Licensed wildlife rehabilitators must adhere to the law and have gone through training on proper handling of injured or abandoned wild animals. Licensed rehabilitators will work to return the animal to the wild, where it will have the best chance for survival. A list of licensed rehabilitators can be found by visiting mi.gov/wildlife or by calling your local DNR office. Springtime brings sightings of baby animals, like this young fawn hidden in the tall grass. 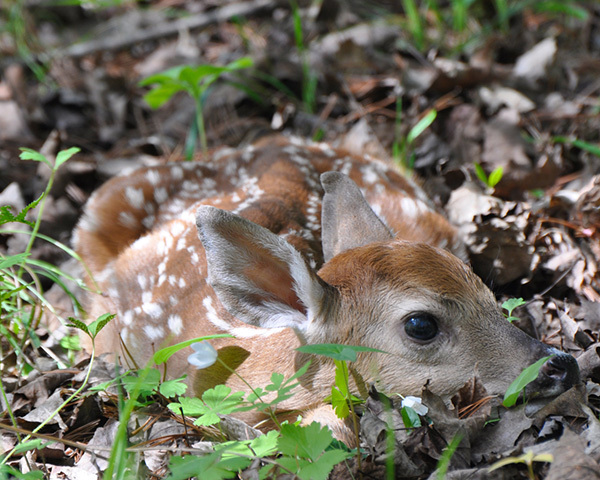 While fawns may seem abandoned, they almost certainly are not. Deer often leave fawns unattended for long periods to help prevent them from being detected by predators. With the arrival of spring, wild animals are giving birth and hatching the next generation of Michigan’s wildlife. Baby red foxes appeared in dens during the last days of March and the first days of April. Young great-horned owls have already hatched and are growing up in stick nests high above the ground. Mourning doves have made nests, and some have already laid eggs. The first litters of cottontails will appear soon. Springtime brings with it an increase in sightings of nestlings and baby animals. The Department of Natural Resources encourages Michigan residents to get outside and enjoy the experience of seeing wildlife raising its young, but reminds them that it is important to remain at a distance. “We appreciate the good intentions of those who want to help, but the animals are better off left alone than removed from the wild,” Keen added. The animals most commonly rescued by well-intentioned citizens include white-tailed deer fawns and raccoons. It is not uncommon for deer to leave their fawns unattended for up to eight hours at a time. This behavior minimizes the scent of the mother left around the fawn and allows the fawn to go undetected from nearby predators. While fawns may seem abandoned, they almost certainly are not. All wild white-tailed deer begin life this way. Most mammals have a keen sense of smell, and parents may abandon their young if humans have touched them. Other wildlife, such as birds, should not be handled either. Adult birds will continue to care for hatchlings that have fallen from their nest. If people move the hatchlings, the adults may not be able to locate and care for them. It is illegal to possess a live wild animal, including deer, in Michigan. Every day an animal spends with humans makes it less likely to be able to survive in the wild. Many baby animals will die if removed from their natural environment, and some have diseases or parasites that can be passed on to humans or pets. Some “rescued” animals that do survive become habituated to people and are unable to revert back to life in the wild. Eventually, habituated animals pose additional problems as they mature and develop adult animal behaviors. Habituated deer, especially bucks, can become aggressive as they mature, and raccoons are well-known for this too. For a list of licensed rehabilitators visit www.michigandnr.com/dlr or call your local DNR office. 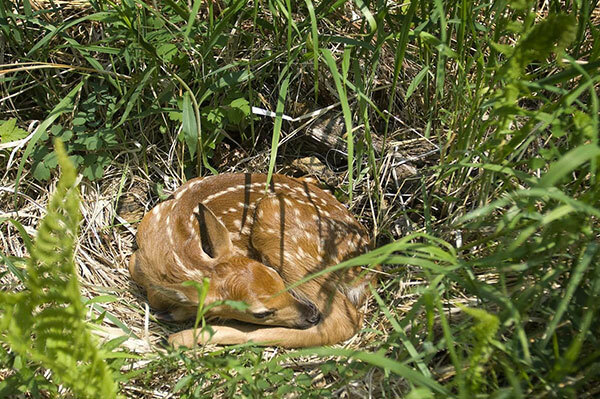 As spring brings the season for wildlife to give birth, the Department of Natural Resources reminds Michigan residents to resist the instinct to try to help seemingly abandoned fawns or other baby animals. * Many baby animals will die if removed from their natural environment, and some have diseases or parasites that can be passed on to humans or pets. * Some “rescued” animals that do survive become habituated to people and are unable to revert back to life in the wild. It is illegal to possess a wild deer in Michigan, and every day a deer spends with humans makes it that much less likely to be able to survive in the wild. * Eventually, habituated animals pose additional problems as they mature and develop adult animal behaviors. Habituated deer, especially bucks, can become aggressive as they mature, and raccoons are well-known for this, too.